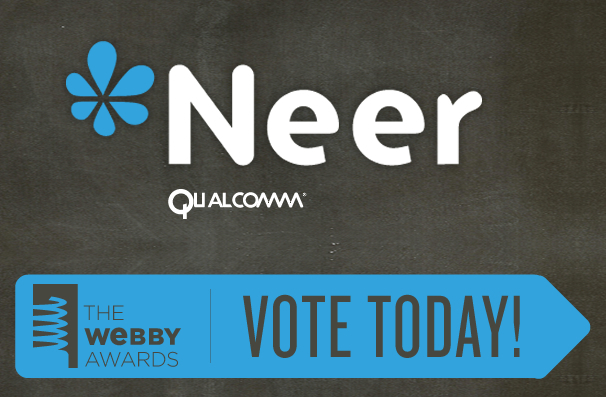 Neer, a location sharing mobile app developed by Qualcomm has been nominated for a Webby Award in the best use of GPS or Location Technology category. The Neer website was created by Ninthlink; and the supporting web version of the app with the same functionality, built by Ninthlink, is coming soon. The Webby Awards is one of the Internet’s most respected symbols of achievement. This year they received 10,000 entries from all 50 states and more than 60 countries. The Neer App allows you to stay connected to those family members and friends that are closest to you, giving its users more control over who’s able to see their location and activities, which differentiates from existing location sharing services that don’t seem to ‘respect the fact that not everything should be shared with everybody”. Going up against the likes of Foursquare, Gowalla and Nike+GPS is no easy task; so be sure and vote for Neer today. Check out the Webby Awards official site to browse the full list of categories and nominees.